← A Sizzling Dinner at Sizzlin’ Pepper Steak! We Had Special Ube Tikoy on Chinese New Year! 1. Cut the tikoy into thin slices. 3. Dip tikoy slices in beaten eggs and fry over medium heat until both sides turn brown. I learned from the same friend who gave this Chinese delicacy that we could actually eat the tikoy as it is. I didn’t know that! I thought tikoys should always be cooked. 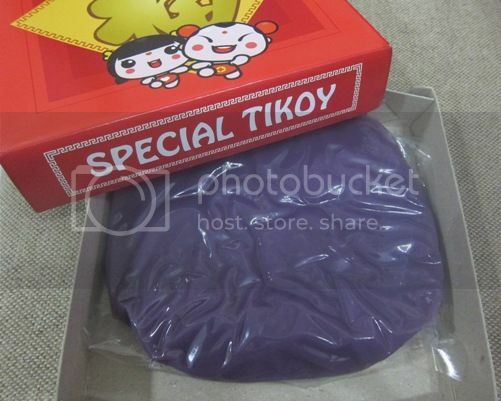 Did you have tikoy on Chinese New Year? Did you eat it raw or fried? This entry was posted in Chinese Delicacy, Chinese New Year, Special Tikoy, Tikoy, Ube Tikoy. Bookmark the permalink. 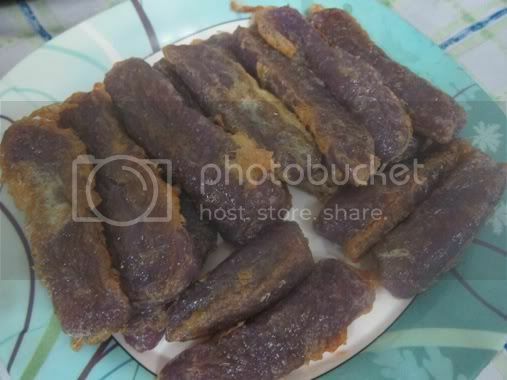 5 Responses to We Had Special Ube Tikoy on Chinese New Year! Is this from Eng Bee Tin? Parang iba ang packaging. Should have bought this too. But hoarding is not an option for us, we already bought 3 boxes. Hubby and I can’t carry that and the toddler too! Lasang ube talaga? Wow, I haven’t tried flavored tikoy before. 🙂 My family also ate tikoy last Chinese New Year. We had the white one fried. Yummy! I don’t know why but I don’t like the taste of UBe tikoy. I love tikoy and I love ube but mixed together, it tastes odd to me.